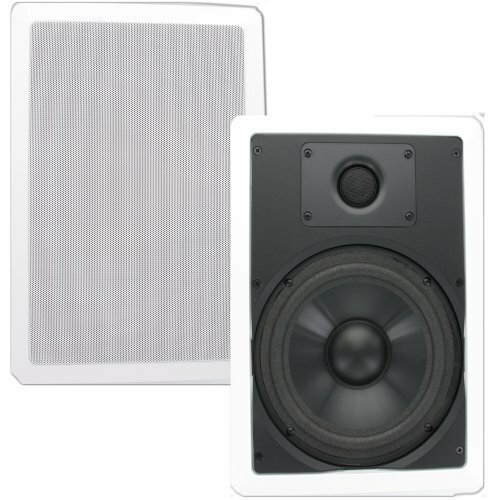 Theater Solutions by Goldwood CS8W pair of In-Wall Contractor Series Speakers are newly designed for consumers who demand powerful bass in a compact package. High quality, lush bass and a full bodied sound at an affordable price. These speakers are perfect playing movie soundtracks or Mozart sonatas. Made with only the highest quality, moisture resistant materials to deliver unsurpassed sound in any listening environment. Sophisticated design and measurement equipment, including computer assisted design software were used to design these speakers to achieve an optimized balance and interface between components to give better quality performance and longer life. Their easy in-wall installation and ultra wide sound dispersion design make them ideal for discreet, single or multi-room installations. All of Theater Solutions models feature the latest swing-out dog leg mounting system for easy installation; paintable white aluminum grills that offer added rust protection in moisture-prone areas such as bathrooms, kitchens and saunas; as well as a fabric scrim inside the grill that hides the drivers from view and will not interfere with the sound. The polypropylene mica 8" driver was designed for extended throw providing a full range of tones coupled with time-tested toughness. The 1 inch pivoting Mylar dome tweeter pivots to direct sound at listeners, and its back chamber smoothest and extends its performance. These state of the art components add up to superior quality and design at a value that is second to none! Great symphony sound when used in conjunction with Theater Solutions by Gold wood in-ceiling speakers!